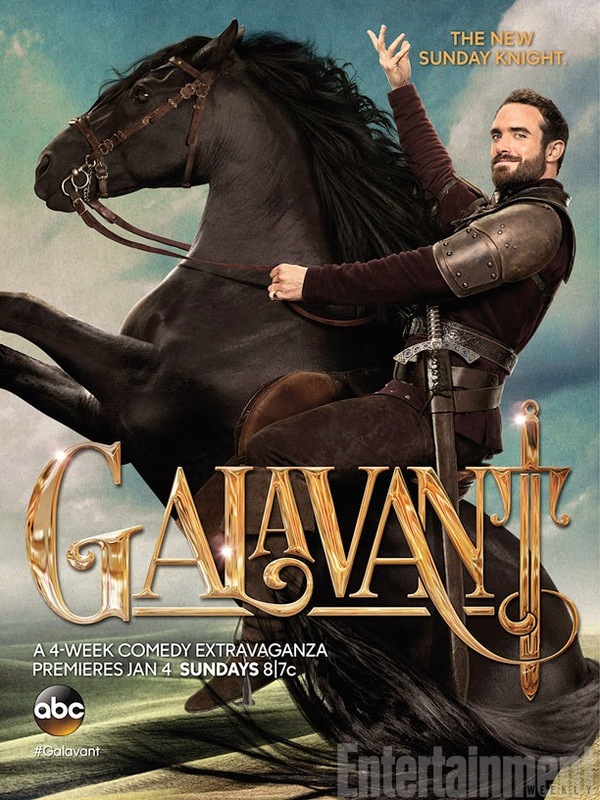 Galavant is finally here, and I cannot be more excited. The melodies have been like an infectious ear worm, and it looks amazing. Seriously, is it legal to have so many fantastic beards on one show. I think the clear answer is no. Galavant opens up with the song that played thousands of times during Comic Con, and I'm not sad to see it again as the handsome Galavant is introduced along with his lady love, Madalena, whom he loved long and hard. They were deeply in love and as Galavant went to get her a piglet, King Richard took a liking to Madalena, and he stole her. Now, its Madalena's wedding day, and only Galavant can save her as he rushes forward. King Richard checks on his bride to be and makes it clear that once they're married they're going to do it. Madalena doesn't sound the least bit enthusiastic about it, but she doesn't correct him either. On a side note how fantastic is Tim Omundson's beard? And how nice is it to see his very silly side? Galavant storms the castle, knocking aside knights and showing off his prowess. No one can stand in his way as he makes it through to save his lady love. Galavant interrrupts the King's wedding. He's willing to fight Gareth, Vinnie Jones, all night, and even all of the King's men, but it won't stop Galavant. He makes a flowery speech. King Richard can offer Madalena fame and fortune, but only Galavant can offer her true love. Madalena has a little something to say about it, and she's thought a lot about things since her kidnapping and she's choosing the fame and fortune, to the delight of King Richard. It makes it an easier life, but she hopes that she and Galavant can still be friends. Gareth steps in to take care of Galavant. King Richard pauses his wedding to kick Galavant while he's down, but the kick barely grazes Galavant, Gareth finishes the job instead. One year later. Galavant's squire, Sid, tries to rouse him. When he was hired it was a most prestigious position, but its changed since Madelena. Sid begs him to take an audience. He brings in the beautiful Princess Isabella with a ridiculously long name. She tells Galavant a tale of woe. Her family was slaughtered, and her people captured. She offers Galavant a priceless jewel from Valencia, which is all they have left, but Galavant isn't interested. She asks what happened to the gallant knight of lore. After losing his lady love, he's let himself go, and he's not ready to find himself. He turns her away. Two months earlier. Princess Isabella sits in her hideaway in the basement. Above her, is King Richard and his Queen Madalena listen to the awful jokes of their court jester. Madalena is enjoying him all too much, way too much. She tells her king that he needs to find out where the King and Queen of Valencia have hidden their jewel. King Richard thinks that he's done all he can, but Madalena snidely comments that Galavant wouldn't have stood for that. She's not exactly secretive about it as she shouts it when King Richard asks what she said. Madalena practically stamps her foot about wanting the jewel. She's definitely not worthy of Galavant, and she runs off with the court jester. The poor cuckold king has no clue. A noisy midday snack is delivered, and King Richard brings the young chef closer for a little heart to heart. He's killed the poor boy's father, and grandfather. He realizes that he's been a huge bully, but he's under a lot of pressure. His bride hasn't been as great as he thought she would be, and he wishes to kill Galavant and then some. Gareth forces everyone to take part in King Richard's odd little ditty about killing Galavant, genocide and winning his bride's love. Gareth points out that Galavant still lives though, and King Richard decides if he can't kill Galavant, then he'll buy his bride's love. He sets out to get the gem from the King and Queen of Valencia. Galavant tries to drown his sorrows, but the local Tavern cuts him off. Broke, the gem catches his eye, and Galavant struts over to Princess Isabella and asks if he can buy her a drink. She refuses, and he tells her that she can buy him one, as he asks for her to continue her tale of woe. Two months ago. She opened the trap door to her hiding spot as King Richard questioned her parents. King Richard has killed many people, but he points out that he hasn't killed them, even though he's been fighting off a cold. King Richard laments that his wife is, well, she's demanding, though others have more colorful descriptions of her, and she wants the jewel. The King and Queen refuse to give it up. It's priceless. King Richard orders their death. Galavant stuffs his face, and Sid is forced to fetch more drinks. Princess Isabella tells Galavant how her father use to tell stories of him, his skill in battle, his heroism. She wants to know what happened to him, and his backstory. He tells her that his parents were people of great love, they both loved and hated eachother. He swore off love. He read and trained, and bettered himself. He comes from a long line of lovers, and couldn't fight genetics. Eventually he fell in love, and he fell hard. Madalena fell softer. He tells Isabella he would love to help, but he's sort of out of the damsel in distress business. Isabella can't turn a blind eye to King Richard's actions. At the mention of King Richard, Galavant perks up. Two months ago. When Isabella cried out at her parents demise, she was pulled from her hiding spot. The gem was recovered, as Madalena comes stomping in again lamenting how inadequate King Richard is compared to Galavant. Rather than tell her that he's recovered the gem, he goes with plan B. To save her parents King Richard tells Isabella to go and find Galavant, and tell him how King Richard has invaded her kingdom, sell the story, and offer up the jewel as payment. When Galavant refuses, tell him that King Richard was a cruel man and that she had to listen to the sounds of him making love to his Queen after which she would cry, and say how she made the wrong choice., and how much she loved Gals. Galavant eats up the story. Galavant is ready to fight. He tells her that they will leave soon. Isabella feels a little bad about stringing along Galavant, but she doesn't have much choice. King Richard tries in vain to prepare to face Galavant. The Queen continues to be spoiled, unimpressed and diddling the court jester and that ends the first chapter of Galavant. So what did you guys think? Was it as good as you had hoped? I have tot admit that I loved it. It was just as I expected. Lucky for all of us, the next episode plays now and it features the delectable John Stamos!